After a great opening night Friday, it was back to the Billy Wilder Theater Saturday afternoon for the next screening in the UCLA Festival of Preservation. 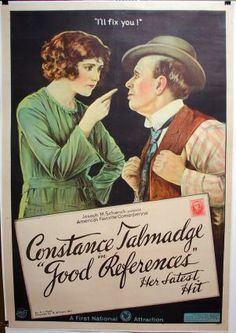 The double bill consisted of a pair of silents, GOOD REFERENCES (1920), starring Constance Talmadge, and THE POOR NUT (1927), with Jack Mulhall and Jean Arthur. The program began with a pair of 35mm shorts, TRAMP STRATEGY (1911) and PEGGY, BEHAVE! (1922). TRAMP STRATEGY, a 12-minute short directed by Alice Guy, was of interest as it was over a century old; bits of it were scarcely visible, but on the whole the print was watchable. A goofy little comic piece about a couple trying to convince the girl's father to let them marry, it was hampered by a pair of unattractive male leads. The "tramp" had so much facial hair he looked more like a werewolf! The print of the eight-minute-long PEGGY, BEHAVE! was incomplete, but what was there was charming. 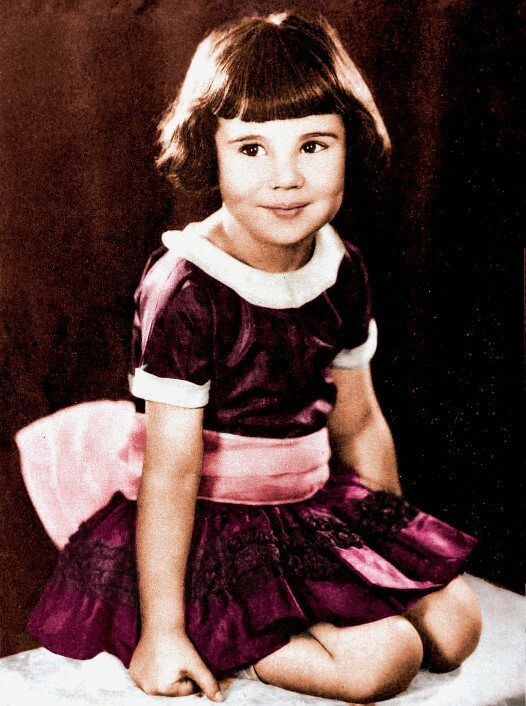 I'd never seen a Baby Peggy short before; she was quite young, probably a little over three when this was filmed, but her reactions to different scenarios were delightful. There was a priceless bit of pantomiming where Peggy pretends to wash a window, to dupe her mother into not realizing it's broken! Both features were likewise in 35mm; it was emphasized in the introduction that while digital has its place, especially for accessibility, it's properly stored film which will ensure longevity for centuries. The long-term security of digitally stored films is unknown. One of the most interesting things about the GOOD REFERENCES restoration was that only Czech intertitles survive. They were translated back into English, with slang and other wordings carefully chosen to fit the various characters' social positions, and new intertitles were then created imitating the style of other films from the studio, First National Pictures. 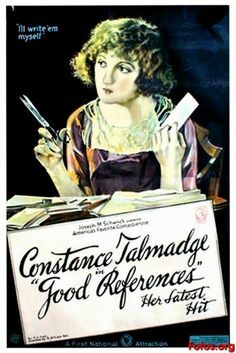 In GOOD REFERENCES Constance Talmadge plays the orphaned Mary Wayne, who's having trouble finding employment due to a lack of good references. She impersonates an ill woman (Mona Liza) in order to land a job as social secretary to a wealthy woman, Mrs. Marshall (Nellie Spaulding). When Mrs. Marshall introduces her nephew (Vincent Coleman) to society, he constantly causes Mary problems due to his unsavory friends, including a boxer (Matthew Betts). I found the story continuity of this 60-minute film a bit hard to follow at times, as others sitting around me also commented at intermission; I suspect we were missing bits here and there. 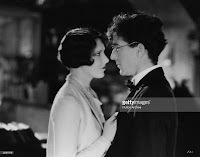 That said, Talmadge was charming and I enjoyed the chance to see her on film; it was mentioned she may not be as well remembered as her sister Norma due to relatively few of her films surviving. GOOD REFERENCES was directed by Roy William Neill and filmed by Oliver T. Marsh. 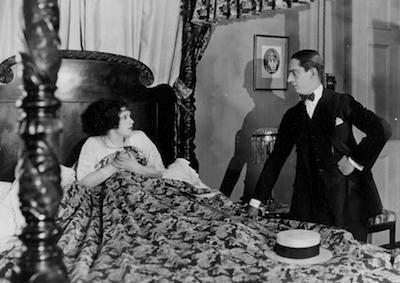 Prominent in the supporting cast is Ned Sparks, who I always find amusing in his '30s films. The highlight of the day was THE POOR NUT, with a young Jean Arthur and Paul Kelly in the cast. Kelly has a large role, but the film was released just after he was sent to prison for manslaughter, so his name was removed from the credits. He was out of films until 1932. You can learn more about Kelly's life from Kristina at Speakeasy. THE POOR NUT is in the same "awkward college hero" vein as Harold Lloyd's THE FRESHMAN (1925) and Buster Keaton's COLLEGE (1927). Jack Mulhall plays John Miller, a botany student who sees a photo of Julia Winters (Jane Winton), "queen" of a rival college, and begins corresponding with her. Unfortunately the nerdy John tells her he's "Jack," a fraternity man and star athlete, which couldn't be further from the truth. When Julia's boyfriend Spike (Kelly) goes to a track meet at John's school, Julia tags along to see if John might be a better romantic option. Warned that Julia is on the way, John seeks help from a kindly sports trainer, and it turns out he's actually good enough to make the track team! Meanwhile fellow botany student Margie (Arthur), who likes John just as he is, takes a job alongside him in the bookstore. I found this one a lot of fun, and I particularly liked that glamorous Julia ends up being a bit unpredictable. When she meets John, rather than being angry she puts her psychology studies to work trying to figure him out. Julia's also quite bossy, though, and all wrong for John...while the quieter Margie pines for him. Arthur was 26 when this was released, and it's no surprise to her many fans that she's charming. I was curious about the campus locations seen in the movie; the film was set in Arizona, and according to IMDb, the movie was shot at the University of Arizona at Tucson. 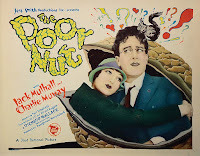 THE POOR NUT was directed by Richard Wallace and filmed by David Kesson. It runs 70 minutes. I anticipate returning to the festival next Friday evening for a double bill of HE WALKED BY NIGHT (1948) and the little-known noir OPEN SECRET (1948).